The Las Vegas valley is surrounded by gorgeous mountain ranges on all sides. 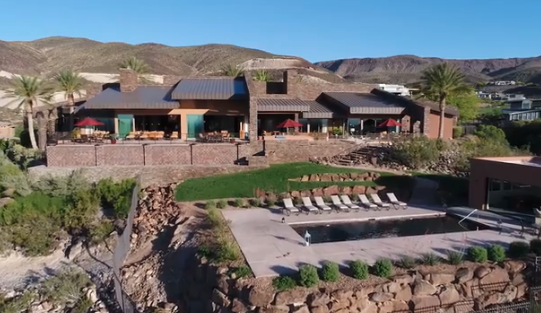 The Red Rock cliffs of the Spring Mountains and the geologically rich areas of Frenchman Mountain each offer a variety of luxury mountainside real estate for sale in Las Vegas, NV. At MacDonald Highlands, you will find some of the most sought after luxury mountainside homes in Henderson on the McCullough Mountain range. The McCullough Mountain range is defined by two distinct areas, North and South. The North end is defined by volcanic rock, hardened magma after a volcanic eruption, whereas the South area is comprised of mainly metamorphic rock, meaning the original rock changed over time due to a myriad of geological processes. MacDonald Highlands luxury homes on McCullough Mountains reside on the north side of the range in the foothills. Here, residents have quick access to town while remaining peacefully secluded in the desert landscape. The North side of the McCullough Mountain range supports a vast range of desert scenery. Residents of MacDonald Highlands luxury mountainside homes in Henderson are surrounded by the vibrant creosote brush and the distinct twisting branches of the Joshua Tree aptly representing desert beauty. Other species include black mountain gamagrass, which cannot be found anywhere else in Nevada, as well as the Teddy Bear Cholla cactus named after its soft and fuzzy appearance. Petroglyphs can be seen at the Sloan Canyon National Conservation Area just 12 miles away from Macdonald Highlands luxury homes on McCullough Mountains. To learn more about luxury homes on the McCullough Mountains, other luxury mountainside homes in Henderson and the desert elegance that surrounds them, contact MacDonald Highlands at 702.614.9100.